￼Soft-touch electronic digital keypad allows for time/ temperature settings, operation of the Rapid Even Air System, standby procedure, activates light, informs user of all these functions & has LED display readout. Full glass style door with etched logo. Cedar backrest along wall for comfort. Takes approx. 10 minutes to warm up. S-DTX6 (4×6) 2600 watts 240V System. S-DTX4 (4×4) 2200 watts 240V System. Full spectrum lighting with SLP Technology – optional upgrade. 1/4 inch Bronze Tempered Glass front windows. 2×4 Clear Western Red Cedar bench with bevelled edges. Costs approximately $4 – $6 dollars per month for electricity to operate. Easy set-up operation takes approximately 60 min. Walls and ceiling are pre-fitted panels. LIMITTED LIFETIME WARRANTY on radiant heating emitters and five-year factory warranty. 11/16 of an inch thick clear T&G Western Red Cedar on all Interior walls, ceiling, floor, and both exterior side walls. (Also available in poplar upgrade). Surgical, stainless steel deflectors, housing, and cover shield. Poplar wood – optional upgrade. Other wood types available upon request. Made in Canada. Safety Certified. 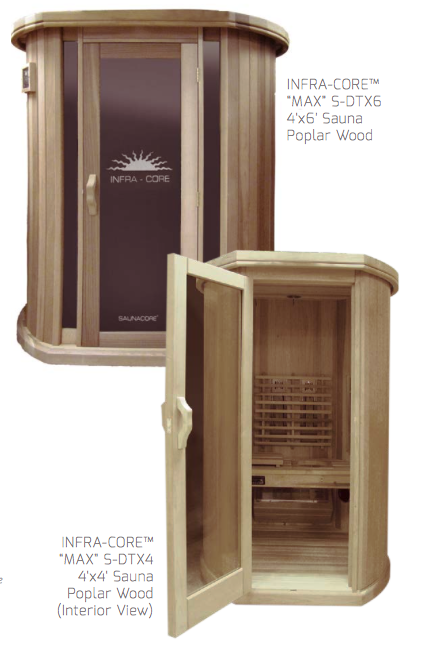 Infra-Core saunas Do NOT have corner moldings which are used to cover up imperfections, all our cedar panels are custom cut and aligned to match from one wall to the other, all V-joint match up, each individual piece of cedar (or poplar) is cut and trimmed for an exact fit. Soft-touch low voltage electronic digital keypad; allows for time/temperature settings, operation of the Rapid Even Air System, standby procedure, activates light, informs user of all these functions, and has LED display readout saunas between 180°F – 220°F.